Do you believe you can get a job you love? I love my job and am so grateful for that. I watched this TED talk, about finding a job you love; not because I was looking for a new job but because,I was compelled to watch it. The title intrigued me and I got side tracked (as you do) after looking for a different talk, about jobs and work in Poland, which looked at the differences in culture and language. But this is what came up in the search. I agree with it entirely, so I thought I would share it. Anything is possible if you believe it! My school reports made me think I was not much good and at writing especially. Because I believed what others thought and believed it was just how I was, so it was for years… Until I decided to do something about it. Having run my own business for at least ten years and won two business awards, I began the think: ‘I can’t be as bad’! I began to listen to how I thought of myself and saw an advert, about online courses, that mentioned not letting your gremlins get in your way and this was when I realised I was the only one stopping myself. writing a book. 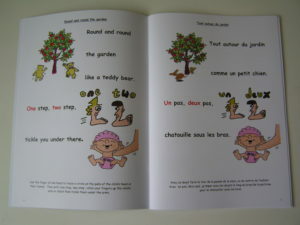 I am the author a book of English nursery rhymes which I translated into French, keeping the meaning, rhyme and the melody. I am still on this journey as I am half way through a bilingual alphabet book and have started writing a health coaching book about stress relief. Watch this space! Writing my first book also meant starting a second business where I read children’s stories in public. Challenging your beliefs makes all sorts of other things happen you couldn’t have even dreamt of. grow by challenging your beliefs about what you can’t do. Let me know what beliefs you think are holding you back in the comments below. ← Stress talk, back by popular demand!